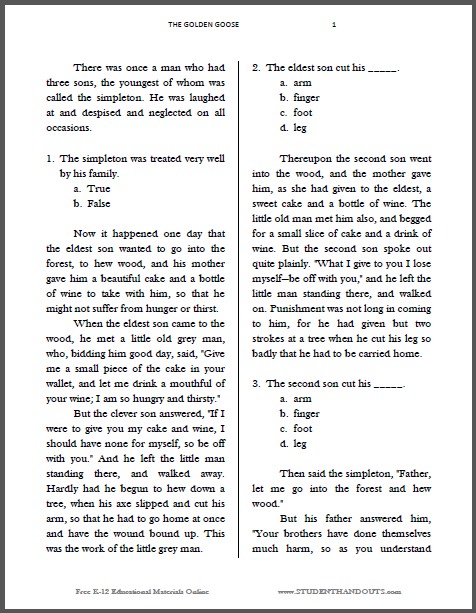 The version of the workbook above features just the text and questions, without illustrations, to save on printing costs. It's six pages in length (or three double-sided sheets). Click here to print. Answer Key: (1) B - False; (2) A - arm; (3) D - leg; (4) A - True; (5) B - gold; (6) She thought her sisters were selfishly keeping the feathers for themselves; (7) 4; (8) B - church; (9) 7; (10) laugh; (11) C - challenges; (12) A - 1; (13) Because he was kind to him. 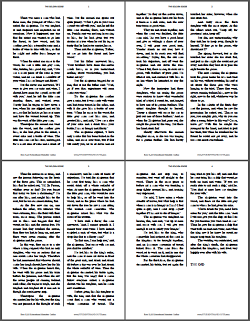 These four pages feature only the text of the story. Click here to print. 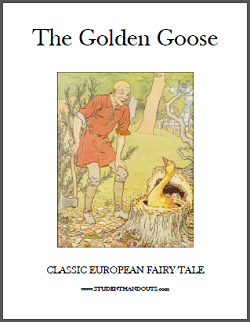 The version above, nine pages in length, features a color cover and black-and-white ilustrations. Click here to print. 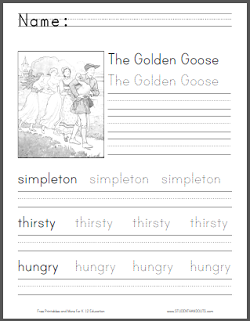 This handwriting and spelling practice worksheet features the title and terms simpleton, thirsty, and hungry. Click here to print.